I have been fascinated by the immune system ever since I could read. That’s why Cells at Work!, a manga and anime that anthropomorphizes the cells of the human body, feels like a dream come true. 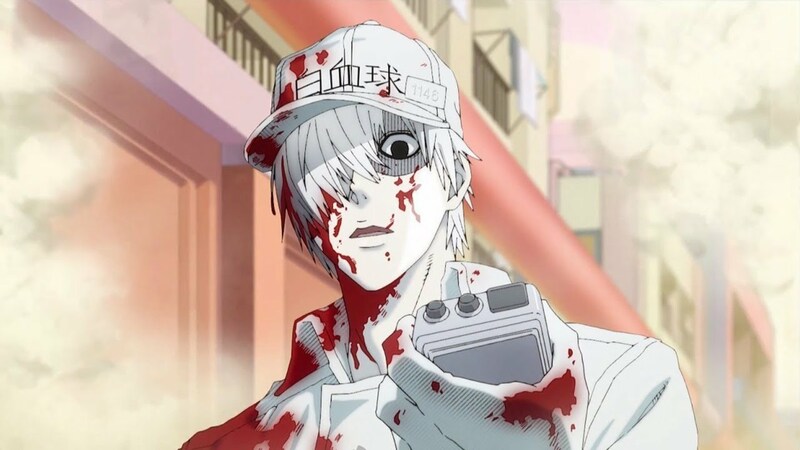 Among the many highly amusing characters, White Blood Cell 1146 is one of the centers of the series, and his actions and personality as the main representative of immune response is an endless source of education and comedy. White Blood Cell is an absurd entity disguised as a straight-man. His sense of duty and his deep, serious voice present a no-nonsense character. However, when you see him literally biting into a virus as he stabs it repeatedly and then turns to cordially greet his good friend Red Blood Cell, it speaks to an individual who is me than meets the eye. In a way, White Blood Cell being the best is the result of his relationship with Red Blood Cell. I love Precure in general, and many of its characters among my favorites, but I’ve never seen myself in a Precure character as much as I have Aisaki Emiru. Her initial appearance as an overly cautious girl who over-prepares for the worst spoke directly to who I am, and my similar anxieties on a daily basis. I can’t exactly relate to the enormous wealth and secret electric guitar, but you can’t expect everything. This year brought back to anime one of the best magical girl series ever—Cardcaptor Sakura—and with it the very greatest best friend in anime history. A now-teenaged Daidouji Tomoyo continues to support her beloved Kinomoto Sakura, but now with the power of a personal drone. What makes Tomoyo great is that she wants the best for everyone she cares for. Wise beyond her years and always willing to dispense advice for her lovely oblivious friends, she’s the one you want in your corner every time. Basically, I am extremely, extremely biased towards Tomoyo to the point that she unfairly destroys the field of best characters of the year, male or female or anything else. Thus, I’ve spun her off into her own category to make this year’s picks more fair in general. There’s one simple word that ties all of my 2018 winners together, including the titanic Tomoyo: friendship. Whether they’re discovering friendship for the first time or long-time believers in its power, all three truly embody the joys and strengths of being a true friend. It’s not just about selflessness, and it’s not just about companionship. There’s a real sense of trust and rapport that come from knowing that you have each other’s best interests at heart, and it lets them overcome just about anything. There’s more and more evidence that Cardcaptor Sakura: Clear Card is canon to the old anime TV series, not least of which is the fact that it actually acknowledges the anime-original character Li Meiling. Recently, however, Meiling has graduated from “name drop” to “onscreen cameo,” further showing the new anime’s dedication to bringing back the characters fans love. In episode 6, Sakura and Kero can be seen having a video chat with Meiling, who’s living in Hong Kong. While showing up on a smartphone screen is not as glamorous as, say, flying in and directly participating in Sakura’s adventures, I’m still quite appreciative of her appearance. In this respect, Cardcaptor Sakura: Clear Card reminds me of Twin Peaks Season 3, when Dr. Hayward shows up on Skype as part of an effort to have as much of the old cast show up as possible. Before that, I assumed Meiling would be more of a Sheriff Harry Truman—mentioned only in passing. Like the other characters, they even brought back Meiling’s original voice, the now-famous Yukana. Back in Cardcaptor Sakura, Meiling was one of her first big roles. Since then, Yukana’s become a who’s who among seiyuu fans, for roles such as Teletha Testarossa (Full Metal Panic! ), Cure White (Futari wa Pretty Cure), and Kale (Dragon Ball Super). I have to wonder if the staff of Clear Card are giving a nod to all the Meiling fans, because I believe there are few anime-original characters as beloved as her. Even though she isn’t part of the manga, she blends into the first anime almost seamlessly, and for some fans is even one of the major highlights. I might even put her on par with another famous “filler” story that transcended the label: Naru (Molly) and Nephrite in Sailor Moon. Here’s to hoping for more Meiling! Cardcaptor Sakura and the Alternative Canon: What is the “Clear Card Saga” Anime Following? When the Cardcaptor Sakura: Clear Card Saga anime announced, one of the questions asked was, would it be following the canon of the manga or the anime? Although the two versions share many similarities, there are also some notable differences between them. Now that the new TV series has been out for little while, it’s evident that they’re acknowledging the old anime…but I have my suspicions that this wasn’t always the case. One of the tell-tale differences between the two iterations of the original Cardcaptor Sakura is how they end. While both involve an exchanging of teddy bears as an expression of mutual love and a temporary separation as Syaoran returns to Hong Kong, the anime has this happen at the airport, while the manga’s version takes place as Syaoran is riding the bus to the airport. Also, while the anime has them reunite in the second film, the manga immediately follows this with a timeskip where Syaoran shows up to greet a now-middle school-aged Sakura. This is roughly the point where Clear Card Saga starts. Prior to the premiere of the Clear Card Saga TV series, there was a special OVA released as a way to bridge the old and new anime. As seen above, this OVA takes its cues from the manga by having the bear exchange take place at the bus, and then transitioning to the middle school timeskip. With this, I assumed the matter was settled. The Clear Card Saga anime would definitely be sticking closer to the manga. Then episode 1 hit, and things didn’t quite line up. When Syaoran shows up again in the manga and OVA, he’s wearing a Tomoeda Middle School uniform. In the new anime, he’s wearing street clothes. Maybe this is just a timing or aesthetic issue. Perhaps it doesn’t make sense for Syaoran to have a uniform after just moving back. Maybe the fact that they show Sakura at school before meeting Syaoran means he couldn’t be there (because she or one of her friends would’ve inevitably noticed him walking around in uniform). Either way, here is a discrepancy from the manga. But they also flashback to the teddy bear exchange, and it’s at the airport! That’s a scene that explicitly calls back to the anime and not the manga. Maybe they just did that for the convenience of the people who watched the old anime. The smoking gun comes in episode 2, when the characters are having lunch together at school. During their conversation, Tomoyo asks Syaoran how Meiling is doing. The reason this is a big deal is that Meiling never shows up in the manga. She’s an anime-original character, and one of the many elements used to turn a 12-volume manga into a 70-episode anime. Whatever the case may be, we have clear unequivocal acknowledgement that the old anime’s events are either partially or wholly canon in the Clear Card Saga anime. So why make that OVA? I suspect that it served multiple functions. First, it might’ve bridge the gap between series, as mentioned above. After all, it’s been about 15 years. Second, it could’ve been used to get the staff and actors used to working on Cardcaptor Sakura again. Third, I really do think the anime was going to follow the manga more strictly, as a way to keep things simpler, but that they changed their minds at some point. If this were the case, maybe it was because they realized many had only ever seen the anime, and thus would be confused by the differences. While the old anime appears to be canon for the new show, the question remains as to how much will actually be different from the Clear Card Saga manga. Referencing Meiling is one thing, but what about having her show up? Will the new anime have more clear cards than the manga, just like it’s predecessor? And what of the fact that Sakura’s dad is a partial reincarnation of Clow Reed—a fact revealed in the manga but never in the anime? Personally speaking, I wouldn’t mind seeing Yukana reprise her role as Meiling and treating us to some Kung Fu fighting. There’s a new Cardcaptor Sakura manga in town—Cardcaptor Sakura: Clear Card Saga—and I practically tripped over myself in excitement to get it. The series is one of my favorite anime and manga of all time, and its charming characters, light yet dramatic story, and cute aesthetic make it a classic of the magical girl genre. But it’s been a long time since we last saw Kinomoto Sakura and the rest of the cast proper (meaning no weird Tsubasa Reservoir Chronicle alternates! ), and CLAMP, the creators of Cardcaptor Sakura, have also changed a lot since the late 90s when the original manga debuted. Thus, while reading I had two questions in mind: in what ways does this new iteration try to capture the old CCS charm, and to what extent does it reflect a more contemporary sensibility? The original Cardcaptor Sakura follows Kinomoto Sakura, a 10-year-old girl who is tasked with collecting mystical cards known as Clow Cards. As she retrieves them, the cards give her magical abilities such as flight, and command over the elements. Eventually obtaining all of them, Sakura soon discovers that she must also transform them into her very own “Sakura Cards” and become their new master. After much hardship (and a developing romance between her and Chinese rival/friend Li Shaoran), she succeeds, leaving her to be quite possibly the most powerful magician on Earth. The Clear Card Saga takes place during the same timeframe as the epilogue of the original manga, when Sakura is in middle school and reunites with Shaoran, who has transferred back from Hong Kong so they could attend school together. In this chapter, we see many familiar faces, including Sakura’s family, her best friend (in fact the best friend in all of anime and manga) Tomoyo, and her magical guardians, Kero and Yukito. The first chapter is mainly there to re-introduce the cast and to set up a reason for Sakura to take up her magic wand once more, and in that respect it is a welcome homecoming. One of the most immediately notable aspects of the new series is that it lacks any signs of current CLAMP’s “noodle people” style that has permeated their works over the past decade and change, wherein characters have unusually long and distended-looking proportions. All aspects of the series seem to be geared towards reviving the original Cardcaptor Sakura look, albeit refined with many more years of experience. In one scene, Sakura mentions that she hasn’t had to use magic in a long time, and I find it to be a striking moment for a couple of reasons. First, while it’s impossible forget that Sakura is indeed a magical girl series, I almost didn’t notice that there was little mention of magic prior to her staring fondly at her old wand. Cardcaptor Sakura is well grounded not just in its fantastic elements but also its human relationships (both platonic and otherwise), and the series draws much of its strength from them. Second, while she doesn’t state it herself, she can indeed be argued to be the strongest magician there is, but she still behaves like an innocent young girl with a heart full of love and energy. Would it be strange to compare her to Saitama from One Punch Man? I don’t think I’m alone in saying that, as fond as I am of Sakura herself, Daidouji Tomoyo is the one I’ve been most looking forward to seeing again. 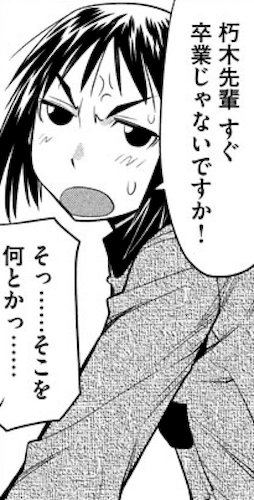 For years, she was my favorite anime and manga character, and it actually wasn’t until I discovered Ogiue that this changed. Even so, Tomoyo is still my #2 because of her warm heart, support of Sakura, and series of minor eccentricities. Her grand return is nothing short of spectacular, and I look forward to seeing more of her and her ridiculous wealth (and bodyguards). Her role in this first chapter is mainly to get Sakura to blush profusely as she takes candid video of Sakura reuniting with Shaoran. 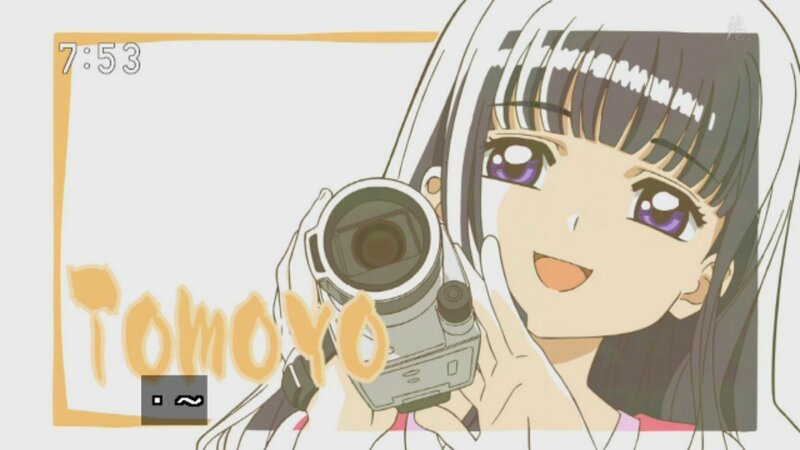 Tomoyo is the kind of person who wouldn’t mind just recording Sakura in her daily life, but I’m confident that she’s going to be the most excited of all that Sakura’s going to have to sling some magic again. I can just picture the inevitable stars in her eyes in the coming chapters. Another interesting point concerning Tomoyo is that she’s no longer in the same class as Sakura. While most of the old Tomoeda Elementary crew has gone on to Tomoeda Middle School, many of them have been split up into different classes. It’s actually a common technique to try and mix things up in a number of series that take place in school. This means that Tomoyo will possibly be interacting much more with other characters. While it’s not like Tomoyo only ever showed up when Sakura was around, or didn’t talk to other characters on her own, it’s still a significant shift in the dynamics of interaction in Cardcaptor Sakura. I want to mention that I probably won’t be chapter reviewing this new Cardcaptor Sakura just because I’m already doing two different series now (Genshiken and Kimi Nakare), and I think three series starts to be a bit too much. However, I might make a post every month or two as a way to look in and see how everything’s going. Thus far, it’s a great start, and even if this chapter mostly treads familiar territory it does so in a way that gives me faith that the series will turn out well. As a final side note, there’s a character poll at the beginning of this issue of Nakayoshi, to vote for who should appear on the cover, and Sakura is #2. While there’s no indication that placement equals popularity, I have to wonder, or perhaps hope. After all, #3 is Momoka, the morally bankrupt protagonist from Sabagebu! 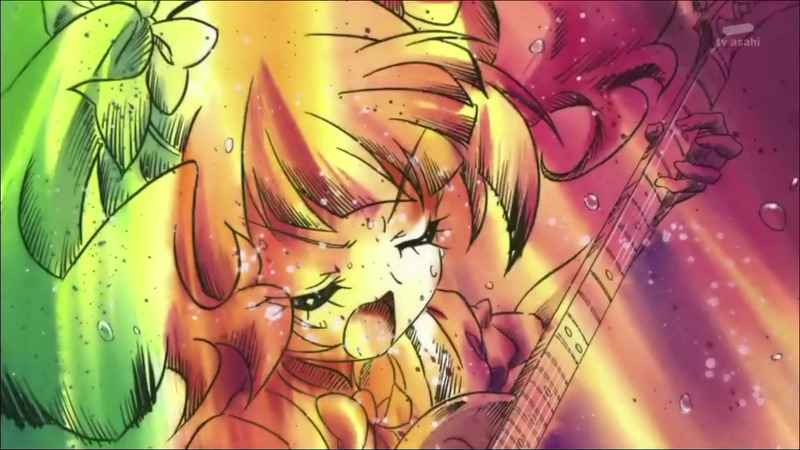 If the young readers of Nakayoshi are fans of Momoka, I am both looking forward to and dreading the future. Sakura might be a safer bet overall, though I wonder if she is still as timeless as she seems. Daidouji Tomoyo from Cardcaptor Sakura is one of my favorite characters ever, from one of my favorite anime ever, and if you’re not a fan of Tomoyo… what’s wrong with you? Whereas normally I would hesitate to buy even some of my most beloved heroines, Nendoroid Tomoyo was a no-brainer. Upon seeing it go up for pre-order, I hit purchase and looked back with zero regrets. Sakura merchandise is common, but Tomoyo much less so, and I couldn’t let this sort of thing pass me by. I don’t own a lot of Nendoroids. In fact, my first one was a Kinomoto Sakura (seen above) that I received as a birthday present. Quite smartly, my friend purchased it because he (correctly) expected that I would not hesitate to pick up Tomoyo. Thus, I don’t have a lot to compare to, and I’m extremely biased, so I’ll call this less a review and more of a celebration. Nendoroid Tomoyo is mostly based on her anime design, as opposed to the softer shoujo look of the Cardcaptor Sakura manga. However, one thing that they did bring from the manga was a hint of Tomoyo’s lavender hair; in the anime it’s more of a gray. When I think about it, rarely do figures try to replicate the look of shoujo manga, likely due to how complicated and not designed for 3-D they are. At least with anime, you can rely on more solid colors. Tomoyo comes in a standard Tomoeda Elementary school uniform, and has a choice between a hat or a hairband, as well as smiling and ecstatic faces. I’ve gone with the hat + sparkly eyes combo for these photos in order to achieve maximum radness, but what really takes this figure over the top is the inclusion of her signature camcorder. Remember kids, this anime was made in the early 2000s, before mobile phones could take HD-quality video. Back in her day, Tomoyo would have to walk 20 miles uphill both ways in the snow in order to film her lovely Sakura-chan and add to her massive archive of Cardcaptor Sakura footage in her private viewing room inside of her mansion, under watch by her squad of lady bodyguards. It’s supposed to have a swing-out screen, but a small missing part makes it impossible to attach. I’m not sure if it was defective or if I had simply lost it while taking it out, that’s how tiny the connecting piece. The other flaw is that the giant head is rather unwieldy, especially with the hat, and sometimes moving it around can cause Tomoyo’s noggin to fall off. Overall, it’s a fine addition to the collection, and when I think about it, I am fortunate that the characters I like tend not to get a ton of merchandise. That’s what I would say…if I didn’t get into Love Live. That’s for next time.